1 - This seems like a good song for a Friday in Lent. PS - I love this song. I found it because JJ Heller sings with them and I am a big JJ fan. Remember that one time when I asked JJ Heller to sing my favorite song of hers at a local concert and one of my awesome blog readers knows the Hellers and hooked me up? I remember, Alishia! I remember that you made my day! This summer I will be in Austen for the Edel Gathering. I am considering setting up some speaking gigs while in Texas to raise awareness for Fulton Sheen's cause for canonization. If you think your parish would be interested in hosting me for an event in the days preceding or following Edel (which is July 25-26) shoot me an email. My presentation is about 60 minutes and I discuss Sheen, JF's alleged miracle, and the canonization process. I've given it to 5th graders and great-grandparents; to crowds as small as 20 and as large as 500. Fair warning: I talk with my hands a lot. Surprisingly I'm German, not Italian. 3 - Each Friday I look forward to 7QT. I like finding new blogs, and catching up on other blogs and I always love reading Jen's post. I've noticed in the last few weeks that there are certain blogs who I always go to first when I scroll through my bloglovin' feed. Domestic Apologist really are quick but they're so good. I love that she get right to the point. Housewifespice. I don't know, lately she's just been moving up to the top of my Favorite Blogs list. In Endless Song's are also really quick. And she's just a darling. What about you? Whose Seven Quick Takes do you most look forward to reading? 4 - A Canadian friend of mine (Hi, Diana!) sent me a link to an article about a baby who came back to life after showing no signs of life for 25 minutes. Hopefully the baby will be fine (please, God! ), but one of the interesting and heartbreaking parts of the article is that it mentions several other babies who also came back to life after having been dead for 12 and 30 minutes. Both of those babies eventually died because of the damage done to their bodies from the severe lack of oxygen. The article then mentions JF, who was dead for 61 minutes, but it doesn't mention that he is fine. JF was without a pulse much longer than any of the other babies in the article and JF is normal. Healthy. Average. And it is all so amazing. Oh Sweetie! Not too sure about getting your picture taken? These two + JP + me = the house feel almost empty in the mornings when L and JF are at school. At first Ben really felt left our when L and JF went to school but he stayed home but it's been so wonderful seeing him and Resa become better friends. Just today they dressed up like pirates. He was Captain Orangebeard and she was his "Matey." 6 - We've had a showing pretty much every other day since we put the house on the market. Sunday is an open house. I'm praying for an offer by the end of Monday. Let's get this show on the road! 7 - And if you missed it, we were on EWTN's Nightly News. The segment on JF and Sheen begins at about 8:21. I can't imagine how stressful having to keep my house cleans for showings would be! You rock. 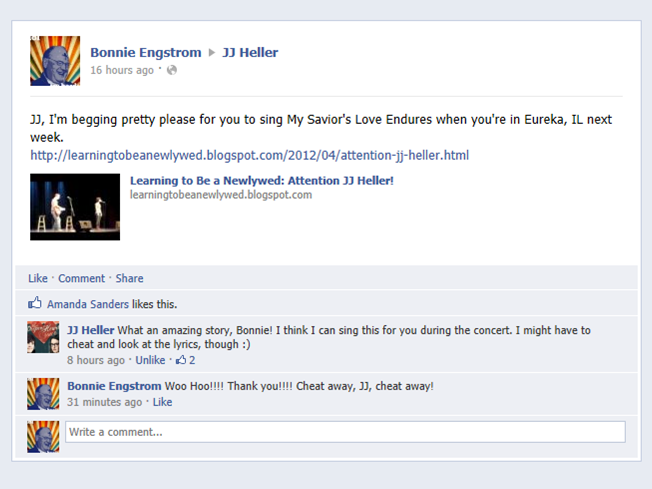 Thanks so much for your sweet shout-out to my blog, Bonnie. You are very kind. :) Hope you have a wonderful weekend! Isn't St. Joseph the Patron Saint for selling a house? His Feast Day is Wednesday, so maybe you should give yourself a few more days and expect an offer by then? It just seems so fitting! Oh Bonnie! And this is the week I don't have my takes written because I'm on vacation visiting my parents! Figures. You're too kind to link to me, and I hope you're ok with having your personal space invaded because I'm giving you the biggest hug at Edel. Hug away, Mary, hug away! 7. I've read your story but I loved actually hearing you and your husband talk about it. So thankful for such wonderful news about James - truly a miracle and such a blessing to be a part of amazing things to come. You guys are an inspiration! eek! I spelled you name wrong up above! I must fix it! Thanks for the links. I love visiting blogs for the first time! I loved hearing you speak at Behold a few years back. I was talking about that Behold with a friend who went and she said that you were the best speaker of the whole event. Hopefully, I'll get to hear you again sometime! Waaaaait. You were at Behold? Did I meet you? I don't remember this and it bums me out! But, you are very kind to say that. No, we didn't meet. But I was there, and so was Jill.